"Make SCID Newborn Screening Universal"
July 25th -27th, 2008 the SCID Community hosted an international conference for families who are affected or have been affected by SCID. The conference was held in the beautiful Blue Ridge Mountains of Virginia, at Wintergreen Resort and Spa. 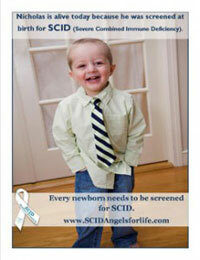 This is the first such event where families with ALL forms of SCID were invited to attend. I am happy to say we had over 140 people in attendance, with families coming from as far away as California and New Zealand! The event provided a wonderful opportunity for patients, families, children, physicians and industry to come together and learn more about this devastating disease, and the quality of life issues that go along with successful treatment. The adult educational sessions offered new, up-to-date information from top experts in the field. The children’s programs were packed with fun-filled activities for all ages, which emphasized teamwork, cooperation, and acceptance.